It’s been a long winter and pretty soon it will be time to put away the heavy wool sweaters and start thinking spring clothes! If you’re worried that your spring wardrobe isn’t up to par, take a peek at what’s “in” this season & have fun incorporating some updated pieces into your collection. Neutrals: Soft neutral colors are everywhere this season---shades of pale gray, beige, peach, and taupe are this spring’s staple colors. Unfortunately not everyone can wear these colors since they tend to wash some women out. If you have this issue, mix soft neutrals with bright colors such as shades of turquoise, coral, and blue. Some of my favorite color combinations are light peach with coral, light gray with turquoise, and layered shades of sand, beige and khaki. I also love neutrals with metallics! The Military Look: In moderation, this trend looks good on many women and is actually easy to pull off. I personally like a subtle military look such as a khaki or olive jacket. Leggins: Again, not a trend for everyone, but if you can wear leggings they can be ultra-cute and very comfortable. Pair them with a long tee (belted or unbelted) and a fitted jacket or with a short dress. Finish off your outfit with either heels or flats depending on the look you’re going for. A nice alternative to leggings are the new “jeggins”, a mix between jeans and leggings. Jeggins are a little thicker than leggings and look more like a skinny jean. The Shirtdress: I’m so glad that the shirtdress is in style this spring. Not only is this dress flattering on so many different body shapes, but it’s a wardrobe staple that can go from day to night with a switch of shoes and accessories. Florals: Beautiful feminine florals are back in style in shades of blues, purples and pinks. Accentuate a plain tee shirt with a gorgeous floral scarf or cardigan. 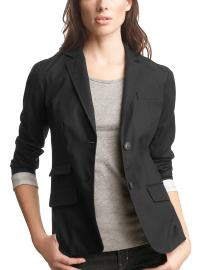 Boyfriend Blazer: The longer & slightly oversized blazer is a simple and chic piece. Try rolling up the sleeves to show off a great lining! Wear over a tee shirt or tank with jeans. Wedges: For those women who find heels uncomfortable, try a wedge this season. Wedges look great with just about everything and can be extremely comfy. Try a neutral color wedge such as a camel or khaki color for a "go with everything" shoe! Embellished Tees: Who says tee shirts have to be boring? I’m loving this season’s tee shirts which are embellished with stones, sequins, and lace!